I’m happy to report that I have very little to report this month. 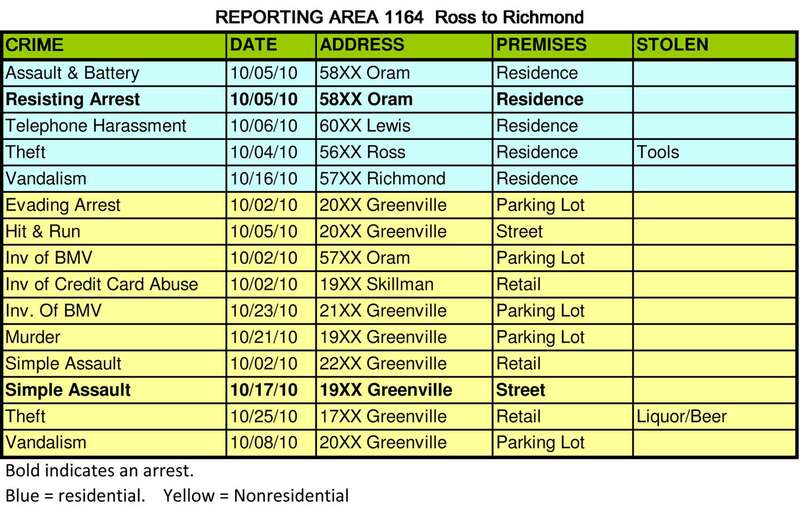 The reported crime in the residentail part of the neighborhood was one of the lowest on record, about a third of the normal amount. 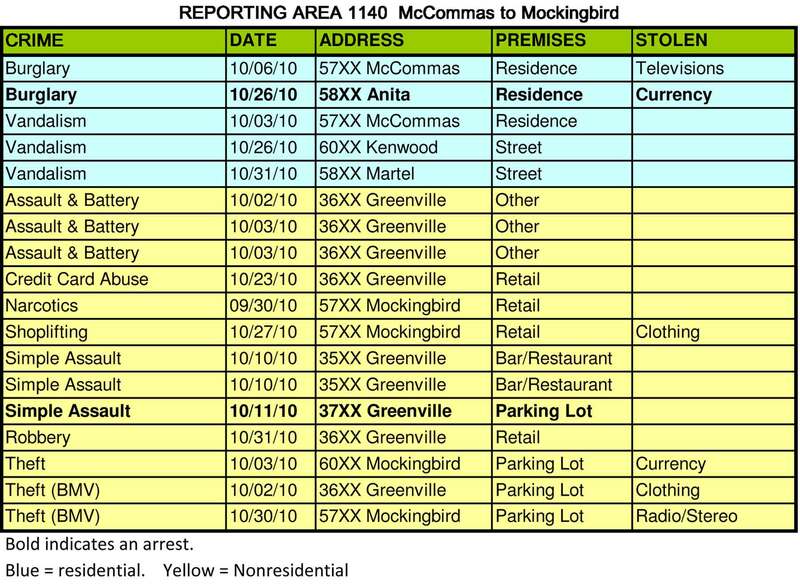 The full reports are below. Last month I told you about the murder that occurred on Lowest Greenville after hours. Although they’ve collected some evidence no arrest has been made and the investigation is still ongoing. Lower Greenville Planned Development Update: Angela Hunt and Pauline Medrano held a press conference on Lowest Greenville last week to make some announcements about the future of Lowest Greenville. In addition to some good news about street improvements and bond money finally getting spent, they updated us on the progress of the Planned Development. At this time, its scheduled to go before the City Planning Commission (CPC) on Dec 16, but could be pushed forward to Dec. 2. Once the CPC votes on it, it will go forward to the City Council shortly thereafter. Once passed, this should be the beginning of the end of the shoot-outs on Lowest Greenville.e call. As with all noise complaints, you need to specify the source and give your name for follow-up. Robbery: There was another robbery at gunpoint this month near San Francisco Rose at Greenville and Marquita. Two out of town tourists were walking to their car when they were approached by three men who displayed a gun and robbed them. No description is available at this time. Holiday Safety: Many of us choose to order our holiday gifts online at this time of year. When shipping, try to have packages delivered to your office where someone will be available to receive them. Otherwise, make sure that a signature is required for delivery. Having packages left on your porch at this time of year is not a good idea. ﻿Service You Can’t Count On: A neighbor contacted me a few days ago regarding a problem with her alarm company. She had an attempted break-in at her home. The alarm was triggered and fortunately the thieves were scared off before gaining access to the house. Unfortunately, her alarm company didn’t call her or the police when the alarm was set off. Their reason for not calling anyone was that they did not have a record of her alarm permits. It might be a good idea to contact your alarm company and ask them about their policy on this matter and to make sure that they have your permit information up to date.